ON MARCH 7, 203, the Roman colony of Carthage celebrated the birthday of Geta Caesar, 14-year-old son of Emperor Septimius Severus. Severus was an African—an ambitious provincial from the lesser aristocracy who had fought his way to power in a civil war 10 years earlier. Just the previous year, he had waged a successful campaign in Africa. Roman power had been vindicated, the barbarians had been driven back, and peace had been confirmed. Roman Carthage was founded in conquest, literally built on the ruins of Rome’s greatest rival. The province of Africa contained at least three different ethnicities—the descendants of Roman colonists, the native “Libyan” or “Berber” inhabitants, and the “Phoenicians,” whose ancestors had once fought Rome for control of the Mediterranean. These three groups intermarried frequently, and many major figures from Roman Africa (including Augustine) were of mixed Roman and Berber ancestry. Romans normally took control in a massive display of brutal force and then assimilated the population to Roman culture. Over time, the descendants of Rome’s enemies could become Roman citizens and share the privileges of the Roman elites. Even the local gods became Roman. They had a strong conviction of their own superiority and divine mandate, but governed their empire with a minimum of bureaucracy and with respect for local customs. Yet this “benevolent” aspect of Rome’s rule depended on the repeated reaffirmation of Rome’s supremacy through “games.” These doubled as popular entertainment and divinely sanctioned violence that propped up Roman authority. Professional gladiators, themselves often slaves or criminals, fought each other and wild animals. But gladiators were expensive. To vary the menu, large numbers of unskilled prisoners were brought into the arena. These helpless victims were unlikely to entertain the crowd by bravery or fighting skill, so it required considerable creativity on the part of the managers of the games to make their deaths interesting. This vast machinery of spectacular and creative bloodshed soon swept up a small but growing group—dedicated to the worship of a crucified criminal, Jesus, who had died in the province of Judea 200 years earlier. It is easy for us to overestimate how important Christians were to the Romans. With the major exception of the fourth-century persecution under Diocletian (emperor 284–305), Romans did not specifically set out to target Christians. Christians were unpopular, and their practices lacked legal protection, but they were often left alone. Only if they came to the attention of Roman authorities would they be ordered to renounce their superstitions and executed if they said no. But this happened relatively rarely—almost casually. On this occasion, though, Christians were among the victims on the menu for the birthday of the emperor’s younger son. And today the pomp and spectacle of Geta’s birthday in Carthage on that day in 203 is known only because one of those victims recorded it as the occasion of her impending martyrdom. An unknown editor preserved her account for the ages. Vibia Perpetua was a 22-year-old married woman from an aristocratic Roman family with a baby not yet weaned. She was arrested along with four other young catechumens (people who were preparing for baptism), two of them slaves. One of her brothers, also a catechumen, was not arrested. In a dark dungeon, trying to breast-feed her infant son, listening to pleas of her pagan father, awaiting a death designed to humiliate and degrade her, Perpetua passed from one aristocracy to another. Her Christian brother, calling her “lady sister,” suggested that she now had the power to ask God for a favor. Why not request a vision to see whether she and her fellow martyrs would be killed or released? “I’ll do that and tell you the answer tomorrow,“ she responded, like any courtier with special access to the royal presence. The resulting vision—a ladder with swords and axes instead of rungs, and a dragon coiled underneath—made it clear that she was in fact going to die. In another vision she saw her unbaptized brother wandering in a land without water, and by the power of her confessor’s prayer she obtained his salvation. In a third, she fought against an Egyptian gladiator. For Perpetua, the spectacle in which she was about to participate had reversed its meaning. Yes, she would suffer, but she would suffer as a warrior, not as a passive victim. The gladiator against whom she would wrestle was the devil, revealed as a dragon. Her fellow-capive Saturus warned her in the vision to be careful of the dragon, and she responded, “It won’t bite me, in the name of Jesus.” She ultimately defeated her enemy by stepping on his head (echoing Genesis 3:15). In the gladiator dream, she was stripped just as she knew she might be in the arena. But rather than holding her up to shame as a weak woman, the stripping turned her into a man. it into a Christian agape supper. As the pagans crowded around to watch them, Saturus told them, “Mark our faces well, so that you will know us at the day of judgment.” When brought out for execution, the Christian men were so defiant that the people demanded they be whipped before they were killed. The women did not behave as fiercely, but they found their own ways of resisting. Initially, they were stripped naked and covered in nets to be gored by a cow. This stripping was the Roman way of showing that these brave and determined women, who had already defied all the male authority figures in their lives, were not only sexually loose but unnatural. But the audience revolted, and the women were given clothing. When the cow attacked, Perpetua pulled her torn robe together to cover her thigh—more concerned, says the narrator of the account, about modesty than pain. As Felicitas fell, Perpetua held her up. When the attack was over, she encouraged her remaining companions. All the martyrs, in the end, exercised control over their own deaths. Only Saturus was killed by an animal, and it was the leopard he had prophetically chosen. A human executioner killed the others. And, as it turned out, he wasn’t very good at his job, wounding Perpetua and causing her to cry out in pain for the first time. Then she guided the swordsman’s clumsy hand so that he cut her throat properly. Perhaps, the narrator adds, a woman whom the devil himself feared could not have died unless she chose to. The story of Perpetua’s martyrdom stands out for the dramatic role played by its heroine and for the prominence of dreams and visions. Along with other North African martyr accounts, it has a particularly fierce and militant tone. 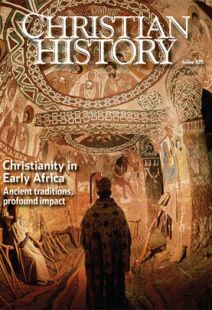 Early North African Christians were particularly likely to see the Christian life in terms of warfare against the devil and to see their deaths as blood sacrifices imitating and participating in the sacrifice of Christ. When Saturus was bitten by a leopard, the pagan audience cried out, “Safe and washed, safe and washed,” which the narrator saw as a recognition that Saturus had been baptized in his own blood—a common early Christian interpretation of how martyrdom saved the martyr. There in the North African sun, on the very site of Rome’s complete victory over its greatest enemy, on the birthday of the emperor’s son, in a spectacle in which they were intended to be passive victims, these Christian martyrs saw behind the façade of Roman power ordained by the gods only a terrified, helpless dragon, only a demonic gladiator rolling in the dust. Their fierce anticipation of divine judgment—their lack of any expression of forgiveness for their persecutors—is not the meekness we expect. The demonization of one’s enemies would have disturbing consequences both within North African Christianity (see “See how these Christians love one another,” pp. 29–33) and down the long years of Christian history. Edwin Woodruff Tait is a frequent contributor to Christian History.